Lying between the Western Ghats and the Arabian Sea, on the northern part of Kerala, modern day Malabar covers the geographical area north of River Bharathapuzha. It includes parts of Thrissur district, the districts of Palakkad, Malappuram, Kozhikode, Wayanad, Kannur, and Kasaragod. The Malabar area is responsible for having provided some of the most delicious and flavourful additions to Kerala cuisine. Malabar cuisine consists of a plethora of vegetarian and non-vegetarian dishes that carry its distinctive flavour and aroma and people flock to these parts to taste the unique flavour of the food here. This food fest is aimed at collecting and sharing all such traditional recipes from the food heaven of Kerala. You can read about the full details of “Malabar food fest” below. If you have any question or problem with submitting recipes, free free to contact us. How to register: Contestants has to share a traditional malabar recipe through our submit recipe page. Anyone who loves Malabar cookery can participate in this competition. Gender no bar, Age no bar, Nationality no bar. Contestants has to share a traditional malabar recipe through our submit recipe page. Only recipes that are of Malabar origin will be accepted. This include foods from Thrissur, Palakkad, Kozhikkodu, Malappuram, Wayanad, Kannur and Kasargod districts in Kerala. Recipe of any type of food item can be shared. Eg: Snacks, Main dishes, Side dishes, Juices etc. The recipes should not be a previously published/shared one in cheenachatti.com. You can check the list of all recipes published so far in this page. Uploaded photo should be of minimum 1000px wide and 500px height. Entries submitted using our on line form will only be accepted. Please DO NOT send recipes via Email or any other communication mean. All such entries will be rejected. No copy paste of recipes will be allowed. All recipes will be tested for plagiarism and those recipes failing the test will be rejected. All entries will be authenticated by a group of experts (not associated with cheenachatti) for their origin, flavor and ingredients. 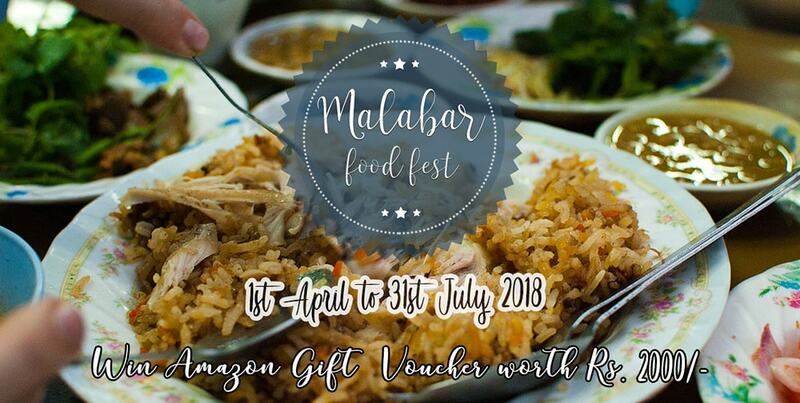 “Malabar food fest” is a limited period event valid through out the event period, from CheenaChatti Webportal (hereinafter referred to as “Admins”). The Contest is open to citizens of India resident in India only. Citizens of foreign countries residing in India are also eligible to participate in this offer. Participation in the offer is optional. Users can increase their chances of winning by submitting multiple recipes and by sharing the links in multiple social media platforms. All entries submitted in this competition will become the property of Cheenachatti.com, India. These contents should not be republished in any other media (print / online) for a period of 2 years from date of submission. Only one winner will be selected per promo. Winners will be selected within 30 days of the closing of the contest or on such other day as may be decided by Admins. The winner shall be intimated through the social media they are using to connect with CheenaChatti. Admins shall not be responsible for any delay, loss, non-delivery of this communication. Winners must claim the prize in the manner communicated by Admins. In case the winner fails to contact the specified person on or before the designated date the Winner shall be deemed to have surrendered the prize/s. All taxes and other levies applicable to the prizes shall be borne by the winners. The winners shall pay the amount of applicable taxes to Admins before claiming the prizes. Prizes of winners shall be sent to winners by courier/post at the postal addresses given by them. Admins shall not be responsible for non-delivery of prizes if the winners are not available/found at the addresses given by them. Decisions pertaining to the “Malabar food fest” are at the sole discretion of Admins and shall be final and binding on all the contestants. to modify the terms and conditions of the Offer, it’s period, prizes, etc., without prior notice to the subscribers. to disqualify any Participant /winner if it has reasonable grounds to believe the Participant /winner has breached any of these terms and conditions. No intimation shall be sent to the participants who are disqualified and/or not amongst the winners. to decide whether a replacement Participant should be selected in the event any Participant is disqualified from the Contest. to replace the Prize(s) with item(s) of similar value in case of stock unavailability.